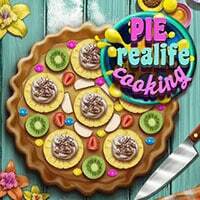 Pie Realife Cooking is the ultimate bakingly fun game in which you are tasked to cook delicious range of fruit pies from start to finish. Become a pastry chef and bake a delicious fruit pie in this awesome cooking game! Prepare healthy fruit on your chopping board and place your favorite ingredients on the pie dough. Bake your creation until it’s crunchy and sprinkle it with chocolate, candy. Or add some whipped cream for a great finish! Looks yummy, let’s try it! Enjoy and have fun in playing this free online game. Pie Realife Cooking is a free online girls game on Round Games.